Wrexham boss Kevin Wilkin says he will wait until the end of the season if necessary before choosing an assistant manager, probably from outside the club. Wilkin has been working without an assistant since leaving Nuneaton to succeed Andy Morrell. The Dragons have not won since his appointment, but Wilkin is happy to bide his time over a number two. "There's no pressing need at the moment for an assistant to come in," he said. "Yes it would help, but if I have to wait until the end of the season and do it in the close season then that may be the case. "There are people that I've spoken to that would be eager to come here. "But as is with anything, finances generally dictate what you can and can't do. "Irons are in the fire and it's just everybody being comfortable with what the budget is for next year and where we can move forward." Although Wilkin has yet to appoint an assistant he has been assisted at training by former Aston Villa, Wolves and Cardiff City goalkeeper Michael Oakes. Oakes was a member of former manager Morrell's coaching team and has been retained by the club on a part-time basis. "He comes in a couple of days a week and has been very, very helpful," Wilkin added. "The assistance that he gives me is fantastic." 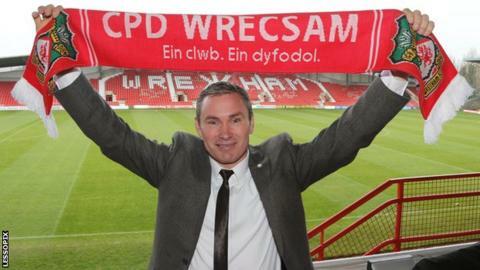 Wrexham have had a draw and two defeats in Wilkin's first three games in charge. Wrexham host Macclesfield on Saturday and Wilkin hopes his new team can register a first win under him. "Winning is everything - it gives you that confidence and people relax a little bit then," Wilkin said. "It just settles everybody down and it's like the start of the season - you want to get a win as soon as you possibly can."